SUV Review: This isn’t the best of times for sport utility vehicles like the LR2. Despite a drop in fuel prices to a five-year low over the last few months, people’s minds are still focused on economy, if they’re car shopping at all, so buying an SUV today takes impeccable credit and perhaps an act of faith. The LR2 could be an interesting choice, though. It feels quite luxurious while inspiring confidence with its high “command driving” position and fine quality of materials. It comes from a family of vehicles specifically designed to handle the rigors of off road travel while maintaining tremendous comfort and dignity. The LR2 carries the blocky, rugged look worn by Land Rovers for generations, but toned down for a new, less wealthy range of prospective buyers. The interior, envisioned by a different designer than the exterior, coordinates well, maintaining the architectural ambiance of the body. Interior surfaces boast a high luster and fit together beautifully. The standard double sunroof lets in abundant light (however, with its translucent shade, can’t be completely darkened). Thanks to theater seating, rear passengers sit a little higher than those in front, so their view of the road is expansive. The variety of lights and controls on the center console at night reminded me of a pilot’s cockpit. The 3.2-liter, inline six-cylinder engine generates 230 horsepower and 234 lb.-ft. of torque. Eighty percent of maximum torque is available across the entire rev range. The more than two-ton vehicle car accelerates from 0-60 miles per hour in a reasonable 8.4 seconds. 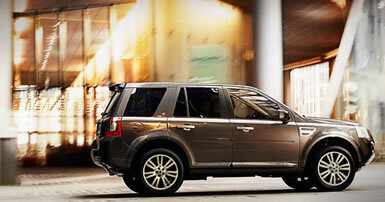 The LR2 uses a specially developed Japanese Aisin six-speed automatic. On it, you can select Auto, Sport, or CommandShift manual shift modes. Sport mode holds low gears longer and shifts down more readily than Auto. Official EPA fuel economy figures are 15 City and 22 Highway. I averaged 17.7 mpg on premium fuel. The EPA score for Air Pollution (7) is good; the Greenhouse Gases score of 3 is one of the lowest I’ve ever seen, and I have no idea why. 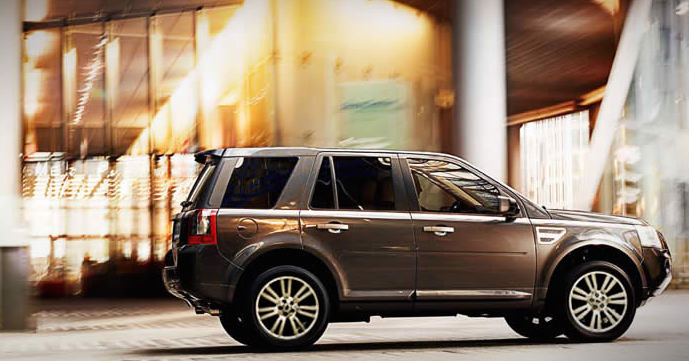 With no need for special levers, the LR2’s intelligent permanent all-wheel-drive system sends nearly all of the torque to the front wheels until you run into a change in hazardous road conditions, at which time it instantly sends some or most of the torque to the rear wheels as required. A specially designed Haldex electronically controlled center coupling provides quick, effective torque delivery. Land Rover’s Terrain Response System® connects the engine, gearbox, center coupling and chassis systems to respond to the varying driving conditions. You can select one of four settings on the center console by deciphering the graphics that stand for General Driving, Grass - Gravel - Snow, Mud and Ruts, or Sand. My week was spent on roads, so I left the setting in General Driving. In case actual off road climbing is on your agenda, Land Rover’s Hill Descent Control (HDC) automatically restricts downhill speeds under all conditions. Gradient Release Control works in tandem with HDC to make sure that the brakes release gradually on steep hills. For 2009, the LR2 gets a few little changes. Nineteen-inch aluminum alloy wheels with a Sparkle Silver finish are standard equipment, or you can order Shadow Chrome at minimal extra cost. The lenses on the turn signals are now clear instead of amber, and the tail lamps get a darker gray surround color. Inside, the leather color changes to Almond in place of Alpaca. The instrument panel now wears artificial wood in a Dark Laurel color or equally artificial Satin Silver, which mimics metal instead. My tester had the latter. The rear load area gets its own 12-volt power socket. A more aggressive HST package is new for 2009, and features a special mesh grille, front and rear bumper and side enhancements and dual exhaust tips. Basically, whether they admire it or not, more than likely nobody will know that your car is an ’09 and not an ’08 unless you tell them. This baby Land Rover carries a base price of $36,150, including $775 delivery and handling charges. My Baltic Blue test car did not come with its Monroney (window) sticker, so I don’t know the exact price, but you can add the four option packages that move the price upward past the $40,000 mark. The Ford Motor Company no longer owns Land Rover, it is now owned by the Indian company Tata, which also acquired Jaguar from Ford. Tata is a huge, diversified company, so the long term future of Land Rover, although uncertain, could be bright.